Posted Friday, July 20th, 2012 by Corey Northcutt. InkJet printing, screens like those on your PC or iPad, and the pointillist art we looked at last week rely on the way our eyes and brains can take incoming light of multiple colors and combine them to make one color that’s an amalgam of its constituents. When we look at an object, we don’t really “see” the object, we perceive certain wavelengths of light, reflected from the object, gathered by our eyes, and heavily processed by our brains. Like all evolved systems, neither the eyes nor the brain are perfect: they are just good enough to get us by in our ancestral environment. That means they can be “tricked” into seeing what isn’t really there. 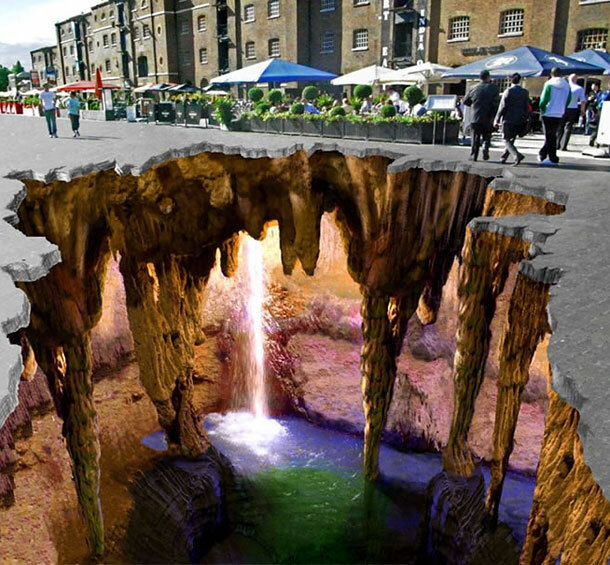 This week we’re going to take a look at some very cool optical illusions that do just that. These optical illusions depend on the fact that the various intensity and color sensors (rods and cones) on our retinas can be slow to respond to changes under certain conditions. 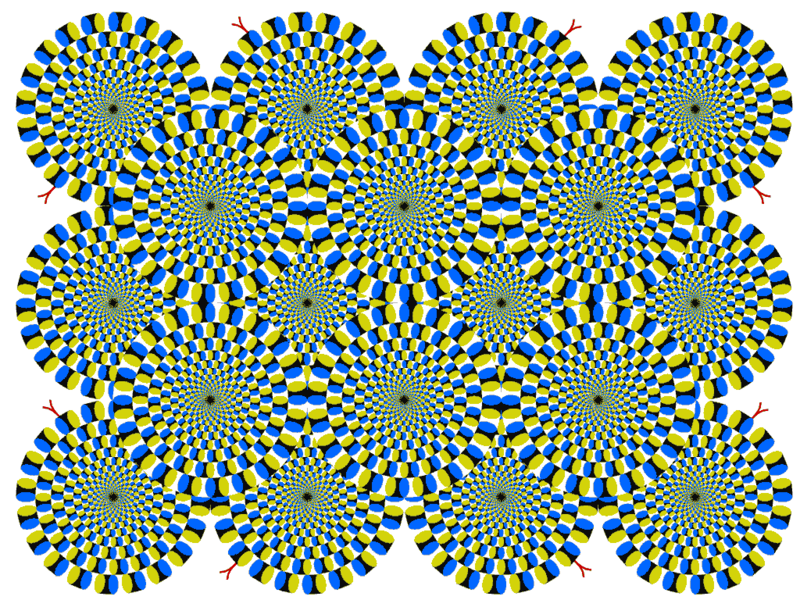 Ordinarily, our eyes are unconsciously darting around in random movements (saccades) which prevent the rods and cones from focusing on one particular color or intensity for too long. When we force our eyes to focus intently on one spot the rods and cones become fatigued or over-stimulated, which makes them send erroneous signals to the brain. 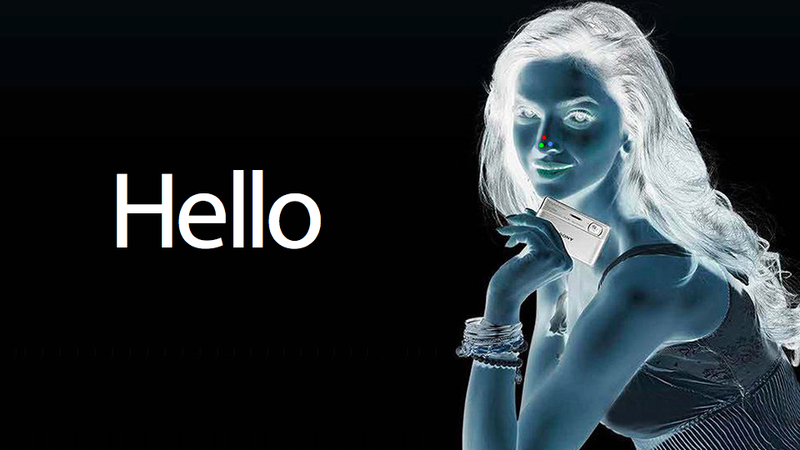 Look intently at the colored dots on the nose of the woman in the picture above for twenty seconds or so, and then look at a blank wall or piece of paper. You’ll see a negative afterimage, which in this case will be the woman in color. This works because the reverse color image in the picture causes color sensors in the eye to become adapted and stop responding. When you look at a blank space, those that aren’t adapted are sending stronger signals to the brain, which is interpreted as seeing the color image. Check out these animated gifs to see a similar effect. Click the images for a larger version. 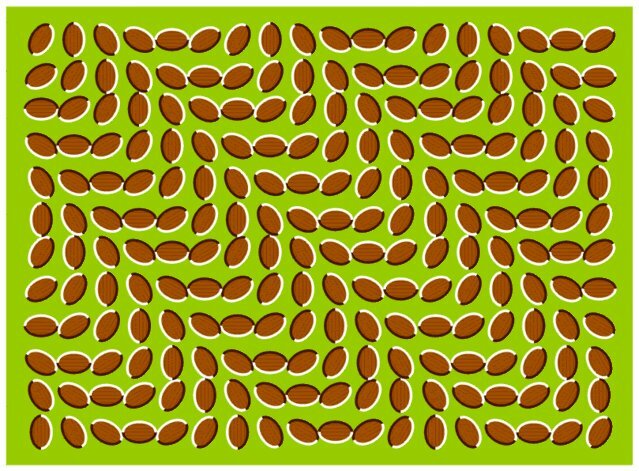 The next one is not an animated image (it’s a jpg), but it will appear to be moving. The appearance of movement is caused by the cognitive processing of color contrast in combination with the saccades we mentioned earlier. Try focusing intently on just one of the beans and the movement will stop. This one works the same way. This one is animated. Focus on the cross at the center of the circle for about 20 seconds and watch what happens to the moving lilac dots. This illusion happens because of three different effects in color and movement processing. We’ll round off with a couple that aren’t strictly related to color perception. If you like side-walk art like the picture above, check out Edgar Müller for more. Do you have a favorite optical illusion. Feel free to share in the comments or on Twitter or Facebook.